Buffalo Springfield’s “For What It’s Worth” came on at a party I attended this weekend, at just the point in the evening when everyone was drunk enough to raise their plastic cups and sing along. Giving everything that’s happening here in the U.S., the song felt a little on the nose, but also eerie and powerful in a way that we were all too embarrassed to acknowledge out loud. 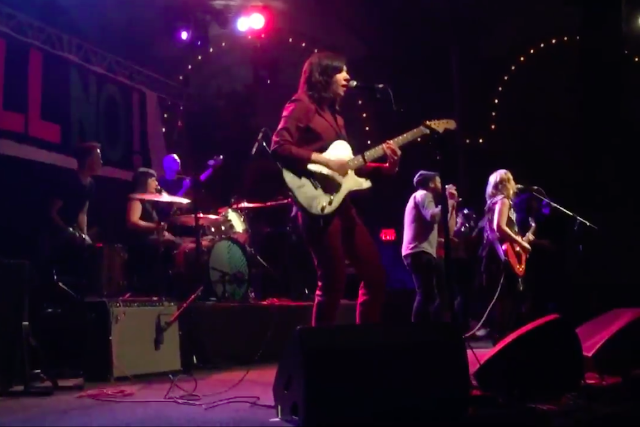 I’d imagine the audience at last night’s benefit show for the ACLU in Portland felt the same way when Sleater-Kinney, joined by Colin Meloy of the Decemberists and Pearl Jam/Soundgarden drummer Matt Cameron, started into a punkish version of Credence Clearwater Revival’s “Fortunate Son.” After aging into the quaintness over the last few decades, the old chestnuts of 1960s protest rock are alive again, whether you want them back or not. Watch a fan-shot video from the show below.